What’s the broker’s role in the design-build process? Every industrial real estate user has its own quirks and needs—so while big-box speculative development can meet many market needs, there are others that are simply too unique. At that point, design-build or build-to-suit (BTS) projects may be the only viable options. But how do firms know what’s right for their project? That’s when having a strong advisor makes all the difference. An experienced and knowledgeable broker, many of whom are SIORs, can guide end-users through the entire process and evaluate all options to select the best course of action. By partnering with an advisor who has been through the design-build and/or BTS process many times before, the user can benefit from both successes and failures of years and clients-past. 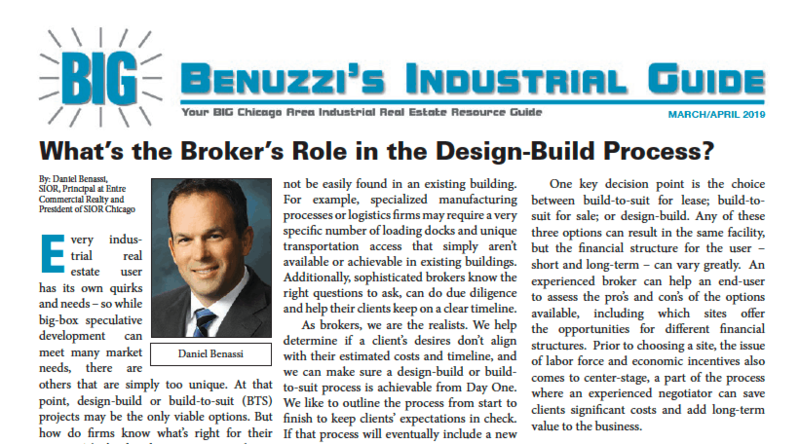 Chicago SIOR Chapter President Dan Benassi provides insights on this topic to this month’s issue of Benuzzi Industrial Guide. Read more in the below PDF.